(These are the words as I hear them. 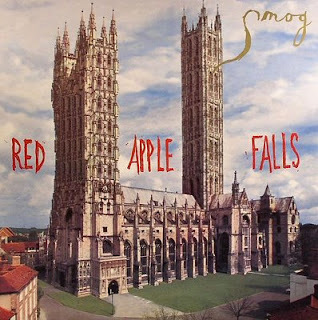 The CD sleeve adds one or two that Bill Callahan's vocal elide.) The song isn't outstanding in the manner of those that follow – Blood Red Bird, Red Apples and To Be of Use – so why do I return to it with such apparent need? Clearly there's the lyrical turning away from the routine toward dream – emphasised by both the uplift of the music as it breaks out of stuck-needle repetition, and by the uncharacteristic tenor of Bill's vocals. It is also a prelude to a sequence of songs in which dream and sleeplessness play across one another. For this reason I'm sure it provides succour. However, this isn't because the song issues an explicit recommendation of withdrawal. Rather, there's something about the two final lines and how they stir me. And I have this thing / Red apples falls. It's difficult to put into words because I am stirred by what is probably wordless. So I suppose it's a sense of exposure to something buried, something otherwise passed over. So what is this thing, red apple falls? For Bill Callahan I assume it is the inspiration and creation of this sequence of songs; their emergence from somewhere other than himself yet also inseparable. In this way The Morning Paper plays the same role in the LP as Earthy Anecdote by Wallace Stevens does at the beginning of his first collection Harmonium and at the beginning of the Collected Poems, and the role of Tlön, Uqbar, Orbis Tertius, Borges' story which he placed at the beginning of Ficciones. Both poem and story preface collections that maintain themselves in the pressured air between reality and imagination – the world and the book – and each introduction is a microcosm of the book to come. Yet each is also more than a microcosm because each is also part of a collection, both separate and inseparable. Stevens' poem ends when the firecat sleeps and allows the bucks freedom of movement, which would be the writer writing without threat from the bristling real. Without a threat, the poem can go on forever or stop right there – choices which are essentially the same – whereas, when the firecat wakes, the bucks have to swerve to the left and to the right in swift, circular lines to create the poem we're reading and, by extension, the rest of the book. In Borges' story, the narrator resists the usurpation of the world by the idealism of Tlön merely by writing a history of the change, making connections and thereby introducing causation into a world where causality had otherwise been eliminated. We wouldn't be reading this story or that poem but for the exposure of sovereignty to what threatens it. It's no coincidence that the second song of Red Apple Falls begins with a waking to the cry of a blood red bird. Red Apple Falls then is itself an exposure; this thing cannot be contained; it is just the beginning. In real time, in history, whenever a man is confronted with several alternatives, he chooses one and eliminates and loses the others. Such is not the case in the ambiguous time of art, which is similar to that of hope and oblivion. In that time, Hamlet is sane and is mad. In the darkness of his Tower of Hunger, Ugolino devours and does not devour the beloved corpes, and this undulating imprecision, this uncertainty, is the strange matter of which he is made. Thus, with two possible deaths, did Dante dream him, and thus will the generations dream him. Gumbrecht's reaction is uncharacteristically impatient. He says this is literature trying to do philosophy's job with a general definitions of literature and, as we have philosophy already, literature should stick to what it does best. Literature, he explains, "is much more concrete than other texts" and this concreteness should take precedence in our reading. Again Harrison agrees and calls "banal" the "deconstructionist notion of the essential undecidibility of literary texts". Gumbrecht goes as far to say that Borges "isn't doing himself any favours" in writing this essay and, in particular, choosing Dante as an example: "Dante is not someone who leaves things in suspension"; he too is a poet of epiphany. Presumably still avoiding general definitions, Gumbrecht insists that "each time you read [a book], you read it in one way". This is the strength of literature so, if you "suspend" Ugolino between verdicts, you drain literature of its strength. He concedes the reader is always aware of the possibility of the multiplicity of meanings but "the strength is not to stay there but to go back and say 'No! This is what Achilles was like' – this what he was like in the very moment you read him, and this is what I call epiphanic". Note that he doesn't say what Ugolino is like in the very moment of reading. Before the discussion moves on, Gumbrecht once again contrasts the epiphanic to what he calls "excessively cerebral" readings. But let's look back at what Borges says. Maybe this will show what's so cerebral about it: Thus, with two possible deaths, did Dante dream him, and thus will the generations dream him. Dante's writing and our reading then is characterised as dreaming. Dreams are entirely cerebral in that they are products of the sleeping brain, except our experience of dreaming is not brainy; it is real and uncanny. Events in dreams are experienced as stories; singularly real in the time of sleep, yet also charged with enough mystery to make one return to the details, to read it again, forever unsatisfied. This is why it can never be epiphanic in the sense Gumbrecht argues for: strength in going back. The reading one goes back to is never a single moment of certainty but, as Borges says, "similar to that of hope and oblivion". When I listen to The Morning Paper, hope and oblivion are both promised. The promise is enough for each to be delivered and withdrawn in a moment and for the moment itself to be promised and withdrawn. Such is the epiphanic in art. Litro, the free monthly literary magazine distributed in London, has published The Two Lönnrots, a new story by Gabriel Josipovici. As Borges lay dying his mind filled with images of lakes, of vast forests of spruce and pine, an enormous sky. He knew this was Finland, a country he had never visited, but which in these last years had been closer to his heart even than the streets of Buenos Aires in which he had grown up and about which he had written so much and so well. The story is an excerpt from Heart's Wings a selection of stories to be published by Carcanet next year. In addition to stories from Mobius the Stripper (1974) and In the Fertile Land (1987), the volume will include previously uncollected stories such as the one above. PS: ReadySteadyBook also has his essay Borges and the Plain Sense of Things.